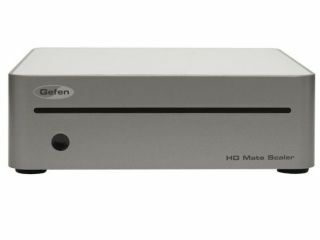 US PC and TV accessories maker Gefen has said that it will launch three new high-def video upscaler/switcher combos at the Consumer Electronics Show ( CES ) in January 2007. HD Mate ScalerThis $349 (£178) box aims to marry the twin worlds of home entertainment and computing by enabling you to view video sources like a DVD player on your PC's display. The box features two component video inputs with accompanying analogue and digital audio connections as well as a DVI/digital audio output. Home Theater ScalerThis $449 (£228) scaler/switcher enables you to combine home cinema sources like a DVD player or recorder, upscale your content to 1080p and then output it via HDMI so you can enjoy it on a flat panel TV or hi-def projector. The scaler sports two HDMI sockets with digital coaxial and digital optical outputs; plus two component video inputs that sport analogue audio connections. Home Theater Scaler PlusIdeal for even older home cinema sources, this $349 (£178) box features S-video and composite video inputs, as well as one component video and twin HDMI sockets. Again analogue and digital audio inputs are included. Both the HD Mate Scaler and the Home Theater Scaler go on sale Stateside in January 2007, the Home Theater Scaler Plus (for which there is no URL as yet) follows in February 2007.